With the Mio Navman 470 Europe, using a Sat Nav just got easier! The modern, lightweight design and clear Spirit QuickStart menu can help you find and navigate to destinations more quickly and reliably than ever. The Mio Navman 470 Europe is preloaded with Western Europe mapping for 23 countries and features 3D Junction views and lane guidance assuring you're always in the correct lane to make a turn, so useful with today's busier roads. 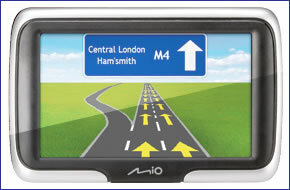 Mio Navman 470 Europe also features Text to Speech with spoken next turn road names. Mio Navman 470 Europe has been discontinued. IQ Routes sets new standards in routing. It uses real-life information collected from millions of drivers to optimise the route that is calculated, giving you the fastest and most efficient journey possible, wherever you are. The Mio Navman 470 Europe has been developed to give you an unbeatable navigation experience, offering 3D Junction Views for clear guidance at junctions and Mio's TruMap views for the clearest map display. The Mio Navman 470 Europe also warns you of safety camera locations, gives instructions for the correct lane required on motorways and tells you the street name for your turn via Text-to-Speech. Accuracy of maps is essential. With the Mio Navman 470 Europe you will also benefit from Mio's Total Refresh Guarantee, which ensures you have the latest map data on your Mio Navman 470 Europe. With the Mio Navman 470's Lane Guidance, you're always in the correct lane to make a turn, so useful with today's busier roads. The Spirit software also features realistic 3D Junction Views that match major road signs, giving you more time to understand what's ahead as you approach an exit or intersection. IQ Routes capability collects real-life information from other drivers and optimises your route accordingly, allowing you to avoid congestion on every journey you take. This exceptional feature means your Mio Navman 470 Europe will learn your driving preferences over time, planning optimised routes to complement the way you like to drive. In addition, the new built-in Keyword Search is designed to help you find your way around the Mio Navman 470 Europe. Simply start typing a road name, place or Point of Interest and the predictive keyboard begins searching the internal database, listing useful options for you to choose from. Mio's QuickSpell Keyboard will instantly offer suggestions for your destination. This intelligent feature will decrease errors and allow you to save time when starting your journey. Pre-loaded safety camera data helps keeps you on the right side of the speed limit. If you're speeding or approaching a camera, a visual and verbal warning gives you time to safely slow down. The Mio Navman 470 Europe can also flag up the speed limit of the road you're on, encouraging safer driving. We want you to have the latest maps available on your Mio Navman 470 Europe. Simply register your new Mio Navman with Mio Advantage within 30 days of first use or purchase, and Mio will check if there's a newer map available for your Mio. If there is, you can download it for free! Mio Navman 470 Europe has been designed to be Plug and Play, and as such can be transferred from vehicle to vehicle with ease by the user. The Mio Navman 470 Europe is powered with a 12-volt adaptor cable in-car (supplied) and attaches to your vehicles windscreen via the Mio Navman 470 Europe windscreen mounting bracket which is also included. Mio Navman 470 Europe includes a free 12 month trial to speed camera locations. Mio Navman 470 Europe is complete with the latest Navman TeleAtlas maps providing street level maps for Europe (23 countries): Andorra, Austria, Belgium, Denmark, Finland, France, Germany, Gibraltar, Great Britain, Italy, Ireland, Lichtenstein, Luxembourg, Malta, Monaco, The Netherlands, Norway, Portugal, San Marino, Spain, Sweden, Switzerland, Vatican.